The Mobile-Pack Caddy DP features multiple compartments for all the amenities needed to replenish a guest room or common area. A viable alternative to carts for those properties ready to go cartless. The Mobile-Pack Mini Cart offers great variety in use and is a versatile solution for various departments from housekeeping, Room Service, minibar attendants and engineering. Bring everything needed into one room! Front: 4 drawers for an unprecedented organization with a large buckle strap to secure drawers from not sliding out when being moved. Left side: 2PVC lined pockets for bottles and 1 PVC lined brush pocket with drawstring. Alternative uses: restocking of linen, general housekeeping, Room Service and Fresh Bites delivery, preventative maintenance and much more! Mobile-Pack is discreet, easily fits into guest rooms, and keeps all cleaning and restocking items organized and accessible. Experience how this Mini cart can be used for your property. 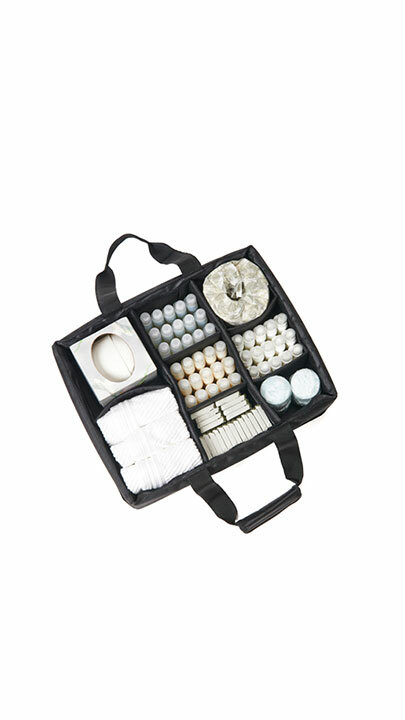 The Mobile-Pack caddy fits into any Mobile-Pack or can be used independently and carried easily. The Mobile-Pack Large is your best choice for holding cleaning supplies and room amenities. The Mobile-Pack Medium gives you maximum portability while holding a generous amount of cleaning supplies and amenities. The Medium pack is great for cleaning public areas and supervisor room checks. The Mobile-Pack Premium offers large storage spaces and plenty of pockets for a variety of amenities and cleaning products. The Mobile-Pack Small has lots of compartments and an ergonomic telescoping handle to make it easy for housekeepers performing turndown service or amenity replenishment. A viable alternative to carts for those properties ready to go cartless. The Mobile-Pack Mini Cart offers great variety in use and is a versatile solution for various departments from housekeeping, Room Service, minibar attendants, and engineering. Bring everything needed into one room! Left side: 2PVC lined pockets for bottles and 1 PVC lined brush pocket with draw string.